"Masaya ako kasi noon pa man, wala pa siya sa mainstream, ang feeling ko, meron na siyang na-achieve. Dito kasi sa atin, ang achievement nakikita pag nasa mainstream siya at nakikilala ng mga tao. In fact, akala nga ng iba, bago siyang artista, but he really started four years ago. 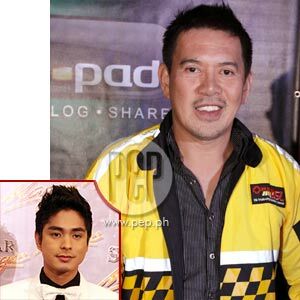 Even the first film that he got, he already achieved a lot," says director Brillante Mendoza about Coco Martin (inset). Brillante "Dante" Mendoza was handpicked by PLDT for being the "top-of-mind" when it comes to directing par excellence. The company chose the films of Direk Dante as the initial offering for their latest product called WatchPad. Through this online portal available to MyDSL subscribers, viewers can view past films of Direk Dante, many of which have been screened abroad, gaining international recognition. In the near future, WatchPad will include works of other Filipino directors, particularly those based in the provinces. It is available exclusively to PLDT MyDSL subscribers in the Philippines. What made Direk Dante accept this project? "Ang feeling namin, ito ang right venue he said. "And mas importante sa akin ngayon na makapag-generate ng audience, more than the money part. Mas importante sa akin ngayon na ma-share ang klase ng pelikula. That is the more important thing. "Actually, three of my films, hindi pa napapalabas sa DVD, so dito, they can watch it here. These are Serbis, Kinatay, at Lola, yung tatlong pinakabago." During the launch held earlier today, October 7, at Annabel's restaurant on Tomas Morato, the director behind the Cannes award-winning film Kinatay pointed out that the versions that will be available online are the versions approved by the Movie and Television Review and Classification Board. The executives of PLDT gave assurance that the videos available in WatchPad cannot be downloaded, preventing piracy problems in the future. ON COCO MARTIN. Direk Dante was asked about the blossoming career of Coco Martin, whom he directed in the indie film Masahista (2005). He is not surprised by the praises being given to Coco for his acting jobs, most recently in ABS-CBN's Tayong Dalawa where he essayed the role of Ramon. "Masaya ako kasi noon pa man, wala pa siya sa mainstream, ang feeling ko meron na siyang na-achieve. Dito kasi sa atin, ang achievement nakikita pag nasa mainstream siya at nakikilala ng mga tao. In fact, akala nga ng iba, bago siyang artista, but he really started four years ago. Even the first film that he got, he already achieved a lot. "Nanalo siya sa Locarno Film Festival at nanalo siya sa Young Critics Circle, which for me is his biggest achievement as an actor. But for most of us, na napapanood siya sa TV, they are seeing a different kind of achievement and success." PEP (Philippine Entertainment Portal) asked Direk Dante to recall his first impression of Coco Martin. He says that it was Ihman Esturco who first introduced him to Coco back in 2005. During the auditions for the film Masahista, Direk Dante recalled why he chose Coco among other applicants. "Usually kasi ang mga masahista, mga hunks o macho ang katawan. Siya yung pinakamaliit. Nag-stand out siya dahil maliit siya!" recalled Direk Dante with a laugh. "'Saka parang madali siyang takutin. Mukha rin siyang inosente, kaya parang hindi bagay sa kanya yung pagiging masahista." What observations did he have about Coco back then? "Mature na siya dati pa, pero ngayon mas maging mature pa yung views niya. Seryoso na siya dati pa sa pag-arte niya. Mas na-appreciate niya ngayon yung mga independent films despite his 'success.'" Coco has starred in Direk Dante's films such as Masahista (2005), Tirador (2007), Serbis (2008), and Kinatay (2009). In which film did he like Coco's performance? "Yung Kinatay, kasi ang haba ng diskusyon namin para sa project. But we never talked about acting." Direk Dante's Kinatay is currently being screened at the University of the Philippines Film Institute in Diliman, Quezon City. He will have an open forum with viewers this Friday, October 9, at 7 pm.